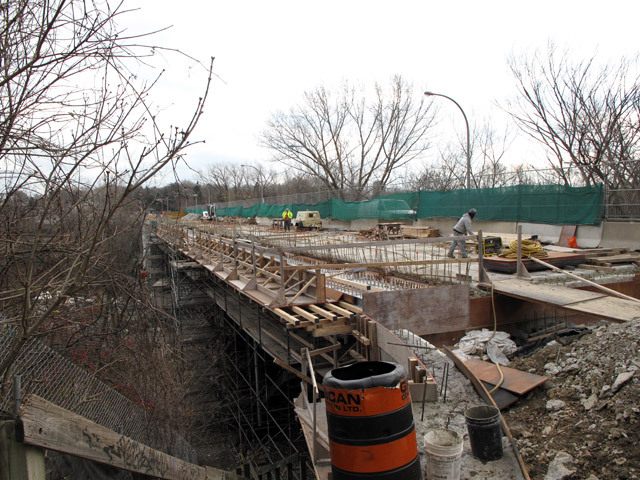 For the past eight months, subway riders passing through Old Mill Station have enjoyed a spectacular view of one of the city’s largest construction projects: the $13.5-million rehabilitation of the Bloor Street West bridge over the Humber River. After being delayed for almost a year, construction, which began in April 2010, is now moving ahead on schedule. Mike Laidlaw, the City’s acting manager of structures and expressways, told Torontoist that he estimates that the project will be complete by November 2011. As bridges go, the Bloor Street West bridge over the Humber River isn’t the largest, or the most glamorous, but it’s one of the city’s most important. Prior to its construction in 1924, the only river crossing in the area was the stone bridge at Old Mill Road. The creation of a street-level bridge at Bloor Street West made travel easier, helped spur home sales in The Kingsway and other nearby areas, and ultimately helped transform rural Etobicoke into a suburban community. And if the name “Bloor Street West bridge over the Humber River” sounds a little cumbersome, that’s because it’s only a nickname. Like many of Toronto’s bridges, the structure doesn’t have a name. Hopefully, the City will eventually get around to giving it one. 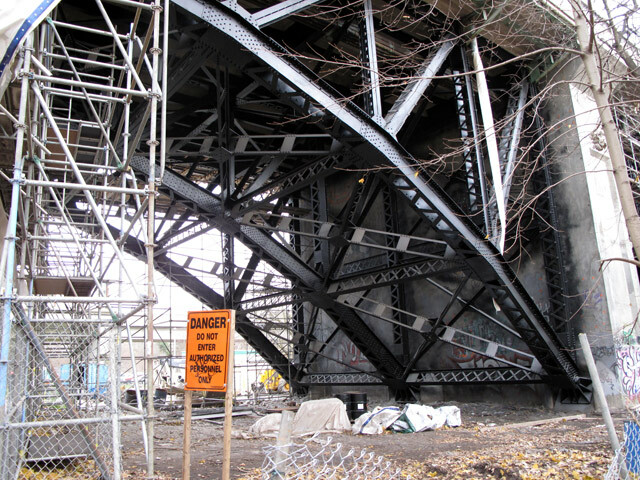 Originally, work on the bridge was supposed to commence in July of 2009, but construction was delayed until work on another of Toronto’s unnamed bridges, the Dundas Street West bridge over the Humber River, was completed. “They didn’t want to have both of those routes shut down at the same time,” Laidlaw told Torontoist. 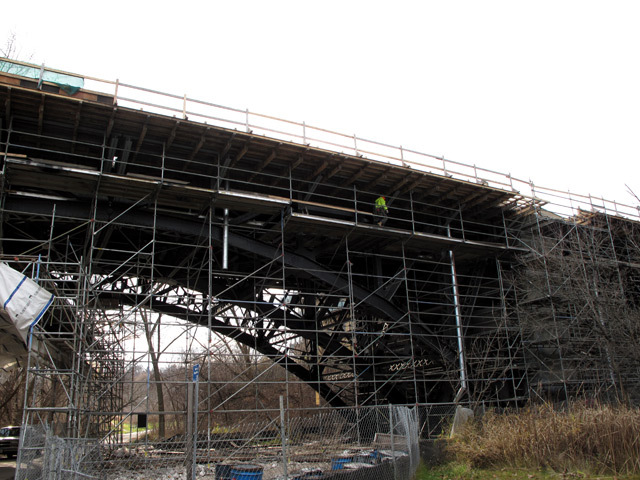 The rehabilitation of the bridge is being carried out in two phases [PDF]. The first phase, which involves cleaning, blasting, and repainting the existing steel supports on the underside of the bridge, is almost complete. But according to Laidlaw, the work will have to be put on hold for the next few months due to winter weather concerns. The second phase involves the reconstruction and replacement of the sidewalks, parapets, railings, asphalt, and the concrete bridge deck itself. New decorative lighting is also being installed and the staircase to the park below is being rebuilt. Currently, construction crews on the deck are working on the north side of the bridge, and moving eastward. Laidlaw estimates that the north side will reopen to traffic in late spring of 2011, at which time construction on the south side will begin. He also informed us that special care is being taken to collect all of the dust and excess material created from the blasting process, as some of the old paint coating the steel supports contains lead. To make sure nothing escapes, large plastic sheets are being draped over the areas being worked on, and filtration systems are being employed to capture the offending particles.